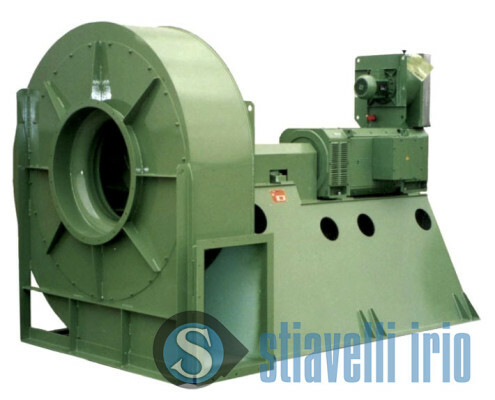 High pressure centrifugal fan for air movement for flat and bent glass tempering. Reinforced high efficiency backward-curved blades impeller (Class II or III). Coupling through flexible joint transmission (Arrangement 8). This model of industrial fan is manufactured in Carbon steel with impeller in Corten (rim speed 174 m/sec). Arrangement 8 consists of impeller mounted on housing and directly coupled to electric motor through flexible joint. Continuous welding for case construction and reinforced nozzle. In the picture you can see the fan coupled with DC electric motor, but the same model can be supplied with standard AC motor driven by VSD. Rotation speed change is crucial for glass tempering process. This is a standard fan modified to satisfy the needs of the customer. It is a heavy-duty construction to reach the required performance; the high rim speed of impeller causes considerable stress on the structure that requests a reinforced construction in special steel (Corten). 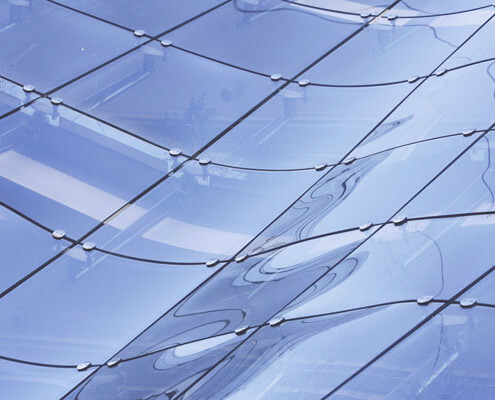 Glass tempering process needs a state-of-the-art knowledge of air flows and pressures that affect the glass sheet during each phase (rest, tempering, cooling,…). Glass production process, furnace air supply, mould cooling and tempering. Glass recovery.